Hundreds of people lined the tarmac at Pyongyang's international airport -- where Kim supervised missile launches last year as tensions mounted -- holding North Korean flags and unification ones showing an undivided peninsula, television pictures showed. But the South's own emblem was only visible on Moon's Boeing 747 aircraft. "Let's open an era of peace and prosperity with the solidarity of one people," read a hoarding displayed outside the terminal. 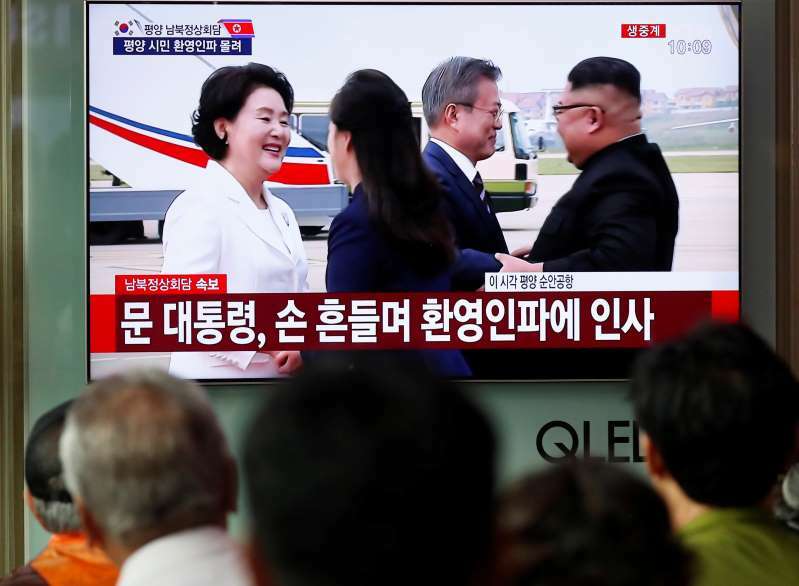 Moon's plane had taken off from the military's Seoul Air Base for the 80-minute flight to the North Korean capital, with the president and his wife smiling and waving to well-wishers before boarding. Moon -- whose own parents fled the North during the 1950-53 Korean War -- is on a three-day trip, following in the footsteps of his predecessors Kim Dae-jung in 2000 and mentor Roh Moo-hyun in 2007. The North's Korean Central News Agency (KCNA) said the summit "will offer an important opportunity in further accelerating the development of inter-Korean relations that is making a new history." Moon, who met Kim again in May, was instrumental in brokering the historic summit the following month between US President Donald Trump and Kim in Singapore, when Kim backed denuclearisation of the Korean peninsula. The US is pressing for the North's "final, fully verified denuclearisation", while Pyongyang wants a formal declaration that the 1950-53 Korean War is over and has condemned "gangster-like" demands for it to give up its weapons unilaterally. "If this visit somehow leads to the resumption of the US-North Korea talks, it would be significant enough in itself," he was quoted as saying before departure. The meeting "will probably generate rosy headlines but do little to accelerate efforts to denuclearise North Korea", Eurasia Group said in a note. Kim would push for enhanced North-South cooperation "especially in areas that promise economic benefits for the North", it added. "Progressives inside and outside Moon's government will have strong incentives to inflate the summit's accomplishments, initially obscuring what will likely be a lack of major deliverables." Moon will be accompanied by several business tycoons -- including Samsung heir Lee Jae-yong and the vice chairman of Hyundai Motor -- and is scheduled to visit key sites in Pyongyang with his delegation. He has been pushing inter-Korean economic cooperation but several South Korean newspapers urged caution Monday, with the Korea Herald calling the businessmen's presence on the trip "untimely." And investment in the North was "fraught with risks and uncertainty," it added. But Moon's office said the inclusion of the businessmen was "not special," given the heads of major conglomerates had been in Pyongyang for the previous inter-Korean summits in the city. Other issues on Moon's agenda include improving inter-Korean ties and easing military tensions on the peninsula. Seoul said that could lay the groundwork for a formal declaration on the Korean War, when hostilities ended in an armistice rather than a peace treaty -- implying that such an announcement was unlikely during the trip.